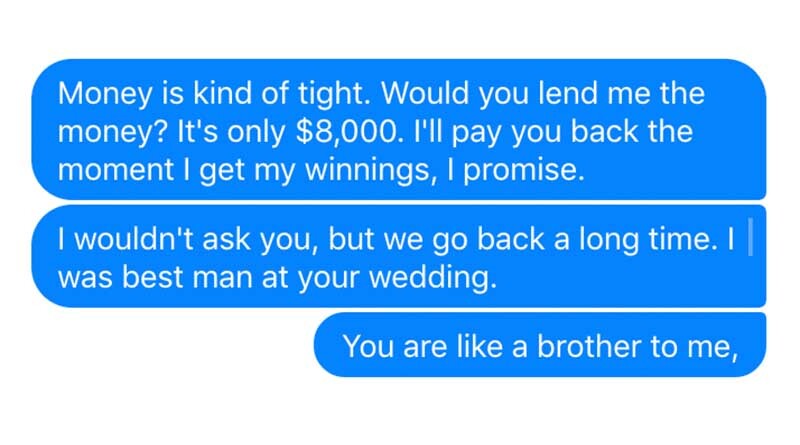 On a recent Saturday afternoon, a well-known consumer advocate tried to take me for $8,000. Good thing I knew how to spot a scam. Don’t worry, I didn’t get ripped off. We consumer advocates have a secret handshake — not to mention each others’ email addresses — and can quickly tell when our identities are being spoofed. But my story is also an important case study that reveals the anatomy of the modern scam. 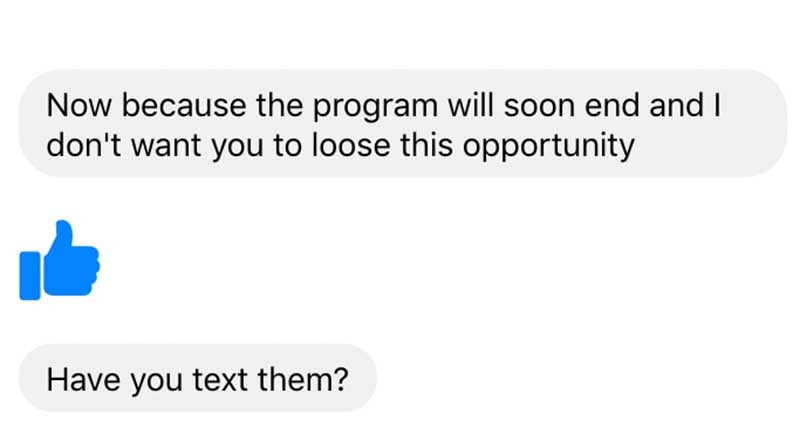 It started with a notification on Facebook that my friend wanted permission to chat with me through Messenger. I accepted, of course. What reason would I have not to? FPWA, by the way, is the The Federation of Protestant Welfare Agencies, a charity. It does not give consumer advocates grants, as far as I know. But, as they say in the movies, you had me at Facebook. The social network is a scam magnet. Anyone offering you money through Facebook should be suspect. That’s the first warning sign: Facebook. 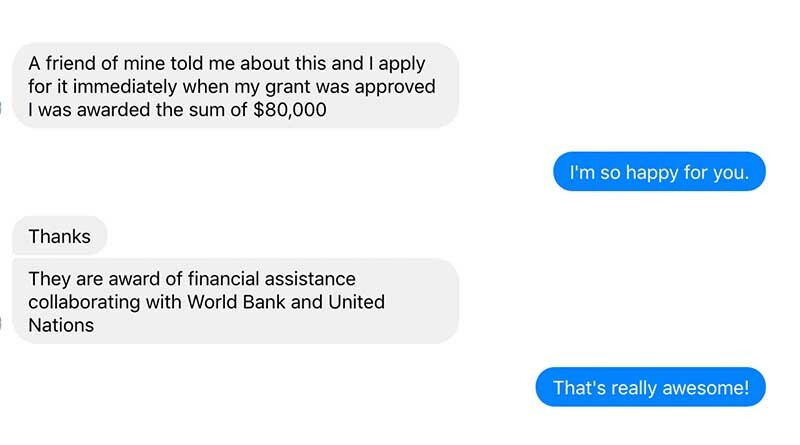 Scammers try to invoke the names of reputable organizations like The Federation of Protestant Welfare Agencies, the World Bank and United Nations to win your trust. They want you to say, “Well, if the U.N. is behind it, it must be legit.” But lowering your guard may be a mistake. When someone says a big charity or organization is behind an offer, that’s when you have to question it the most. My friend claimed more money was available, but I had to move fast. I needed to text a different phone number. When I didn’t immediately respond, he became anxious. “Have you text them?” he asked me. That’s when I decided to play along. “What is there respond?” he asked. By now, I knew I was dealing with a variety of the government grant scam. That’s where a government agency offers you money, but you have to pay a fee to the government first. I didn’t even have to send a text to find out. I guessed that the text message would ask me for money. Here’s where the case kind of goes off the rails. I emailed my friend and sent him screenshots of our conversation. He verified that it wasn’t him, but also noted that his account hadn’t been compromised. Instead, someone had spoofed his Facebook account, using his name and harvesting a photo of him. That’s why he had to ask for permission to message me, even though we were already Facebook friends. That’s another sign you’re about to be scammed — your “friends” are contacting you with a breathless money offer. And, on careful review, they are not really your friends. They’re someone pretending to be your friend. If you ever receive an offer like this, call your friend directly to find out if it’s really him. Don’t rely exclusively on Facebook or on email. If you do, you could be wiring $8,000 to some guy in Nigeria. Inevitably, the scammers don’t have a full command of the English language. That’s actually a good thing. If you pay close attention to the way they write, you can tell it’s a fake offer almost immediately. Consider the way my scammer has already butchered the English language and continues to do so in our final exchange. Me: Money is kind of tight. Would you lend me the money? It’s only $8,000. I’ll pay you back the moment I get my winnings, I promise. I wouldn’t ask you, but we go back a long time. I was best man at your wedding. You are like a brother to me. Scammer: How much should I lend you? Me: $8,000 — I’ll pay it back as soon as I get the money. Scammer: I can’t lend you such amount how much did you have with you now? Me: Well, you know my situation. After my house was swallowed by a sinkhole and both my parents died in that horrific hunting accident, I don’t really have the money for anything more than the basics. I only have enough to cover the therapy bills for the cat. You’ll need to lend me the entire amount or I can’t do this. Scammer: Why can’t you go for loan? “Go for loan”? Come on. Who falls for this kind of scam? Plenty. Although no one keeps nationwide records on these scams, I think it’s safe to say it’s pretty common, based on the number of warnings I see online. So the next time someone offers you free money on Facebook, defiles the English language and the pitch seems a little unusual, don’t walk away — run!